Amelia Adamo joined Copaken Brooks in April 2014. 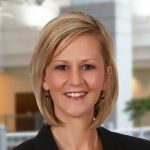 She is responsible for managing the day-to-day operations for a varied portfolio that includes Western Auto Lofts, an iconic three building community located in the Kansas City Crossroads Arts District and 1201 Walnut, a 29-story, Class A office tower as well as other downtown properties. She previously managed WallStreet Tower, a 20-story luxury condominium development in the heart of downtown Kansas City. Amelia comes from a residential management background with an emphasis on residential apartment leasing operations and customer service. Through implementation of a strong marketing and resident retention plan, Amelia was able to successfully lease her residential property to 100 percent occupancy for the first time since the property was built. 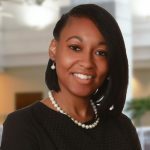 She has a passion for quality customer service and delivering requests in a timely manner which has helped service the WallStreet Tower and Western Auto Lofts unit owners and staff. Amelia oversees the daily operations, service requests, and service contracts; coordinates tenant improvement and capital projects; and is responsible for monthly financial reporting and preparation of annual operating and capital improvement budgets.